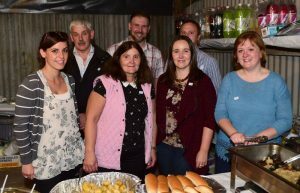 The NIHBA field evening and BBQ was held at the home of Castlepoll Herefords ( C & M Beatty and son) 49 leaney road, Dungannon, Co Tyrone. 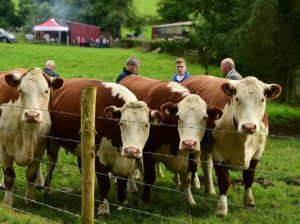 With four generations of Beatty family involved with Herefords this was a momentous occasion for the family. A bumper crowd of over 160 attended the evening consisting of friends, neighbours, Hereford breeders both past and present coming from many counties throughout Northern and Southern Ireland. Many of these included new Hereford breeders attending the NIHBA event for the first time. The evening started off with stock judging and viewing of the herds on show. 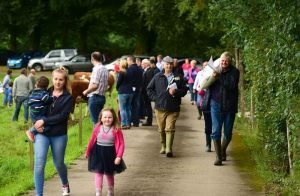 The herds on show included the Braemount and Castlepoll herds belonging to C & M Beatty and with 47 years of experience had a number of cows with calves, dry cows and maiden heifers and bulls. Also on view was the Tirelugan herd belonging to P & W Beatty with cows and calves and maiden heifers. 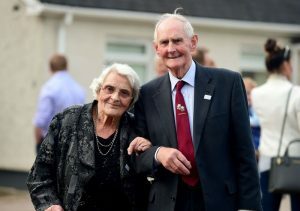 The focal point was the opportunity the guess the weight of both male and female (supreme) champion the 2016 Balmoral show with the beatty families having scooped both these awards this year. As the evening wore on everyone the headed for food where there was plenty to suit everyone. With steaks, burgers, numerous salads and a wide variety of desserts everyone had their fill. The master judge for the evening was the well renowned stockman Mr Steve Edwards from England. 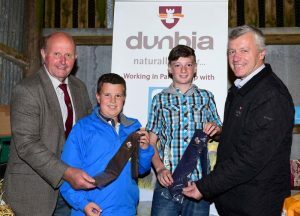 A big thankyou must go to everyone who supported and helped with this event but a special mention must go to our main sponsors for the evening Dunbia who very kindly donated all the steaks and burgers for the bbq, and a special mention to Kenny Linton from Dunbia who organised all of this superbly. 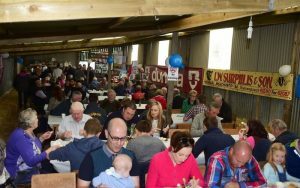 A thankyou must also go out to some of the beatty family suppliers who donated items for auction the main ones being L W Surplis, Dungannon Farmers Mart, SMP Concrete Products Ltd, Irwin feeds, Irwin Farm Supplies and OddBall Engineering. Many other supplier to the beatty farm also donated items and a big thankyou to them to. Thanks must go to the Committee Members of the NIHBA who also provided items to be auctioned and also supplied the desserts which were enjoyed by all. 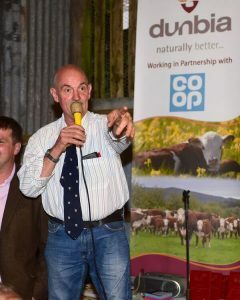 The NIHBA would also like to thank Donald Beatty for conducting the auction where he did a wonderful job and also Ian Coulter who gave of his time to come and tell some yarns and craic a few jokes which went down very well. Two people who we owe a great deal of thanks were our chefs Ashley and Vanessa who did an excellent job of cooking the steaks and managing the bbq’s. 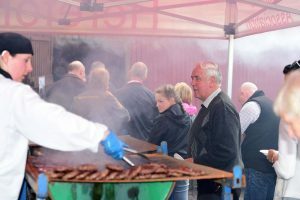 Thanks must also go to photographer Alfie Shaw who kindly gave of his time to capture the evening with some memorable photo’s Thanks to every one else who helped in any way to the success of the BBQ as there are just to many to mention by name. It gave the NIHBA great pleasure in handing over a cheque for £2500.00 to the Alzheimer’s Society.